especially those he has entrusted to my care. Teseo Isani was a military officer who was stationed in Verona, Italy during World War II. During that time, a friend confided to Teseo that for many days he had been hiding an American soldier in his home. He was aware of the danger of the situation. If he was caught by the Gestapo, it would be his death sentence. He asked Teseo if he would be willing to take the American soldier and he agreed to do so. For a temporary solution, Teseo hid the American in his truck under a large load of wood. Unfortunately, soon after Teseo did so, the Gestapo became suspicious. Teseo’s truck was searched and the American was found. Teseo was immediately arrested and placed in custody. He was condemned to death for his crime of harboring an enemy. In the detention facility, Teseo waited for his execution day. There was nothing he could do to save himself. One day, Teseo suddenly heard a very distinct voice which said to him with great insistence, “Escape! Escape!” Teseo did not know where the voice had come from. He was not sure of the meaning of the message either. He did not have the means to escape. He knew that if he tried to walk out of the detention facility, he would be instantly shot. There were armed guards stationed at every check point who were not afraid to use their weapons at a moment’s notice. However, Teseo reasoned to himself that he was going die anyway. “What does it matter if I die today or tomorrow?” he said to himself. Teseo opened the door of his cell and looked down the hall. Armed guards were standing at various posts all along the corridor. He decided to take the plunge. He stepped out into the corridor and started walking and to his utter amazement, the guards did not seem to notice him. Suddenly, one of the guards became aware of Teseo and reached for his gun. He pointed it at Teseo and pulled the trigger but it failed to go off. Teseo then broke into a run and managed to flee unharmed. The Nazis posted Teseo’s picture throughout the city of Verona. A large sum of 100,000 lire was offered to anyone who could find the fugitive. But Teseo was safe. He had already made his way into Switzerland. 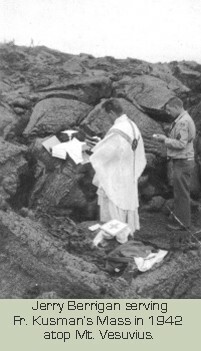 Francesco Cavicchi and his wife visited Padre Pio’s monastery for the first time in June 1967. Francesco’s wife had a great desire to meet Padre Pio. She spoke to Francesco about it and insisted that he accompany her. He did not share his wife’s enthusiasm regarding the trip to the monastery but in order to please her, he finally agreed to go. Francesco had learned that Padre Pio would not hear a person’s confession if it had been less than ten days since their last confession. Francesco had been to confession just three days before. But since he had made a special trip to San Giovanni Rotondo, he did not want to miss the opportunity. He decided to take a chance and go to confession anyway and he hoped that he would not be found out. Padre Pio was hearing the men’s confessions in the sacristy of the old church. As Francesco waited in the confessional line, he grew more and more uneasy. He wondered to himself how he had the nerve to disregard the “ten-day rule.” Padre Pio looked out at the men waiting in the line, and his eyes fell on Francesco. “Come forward, my son,” Padre Pio said to Francesco. “I have been waiting for you for a long time.” Francesco could not grasp the meaning of his words. How could Padre Pio have been waiting for him for a long time? They had never even met. Francesco knelt down in the dim light of the sacristy. As he made a move to kiss Padre Pio’s hand, Padre Pio withdrew it from him. It was not a good sign and Francesco knew it. Next, Padre Pio asked Francesco the question that he did not want to hear. “How long has it been since your last confession?” There was a silence while Francesco pretended to be thinking about the answer to the question. He told Padre Pio that he could not remember when he made his last confession. Francesco did not know what to say. He was sure that Padre Pio could read his heart and his mind. It seemed obvious that Francesco was trying to avoid the question. Francesco had kept head down and his eyes lowered from the time he had entered the confessional. He did not have the courage to look at Padre Pio full in the face. But now, for the first time, Francesco lifted his gaze and looked directly at him. Padre Pio was speaking to Francesco about an incident that had happened back in 1943, during the second World War. Francesco remembered the incident well. He would never be able to forget it for as long as he lived. 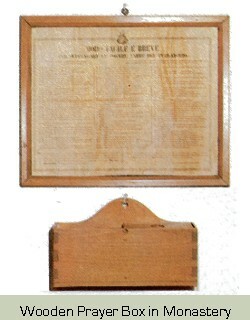 He was twenty-eight years old at the time and worked for the State Railway in the city of Rimini. On that particular November day in 1943, Francesco happened to be riding the trolley bus back to his home for his lunch break. There were about ten other people on the bus that day. Included in the number was a middle-aged Capuchin monk. Suddenly, the sirens in the city gave warning of an air-raid. Bombs then began to fall all around. The bus driver accelerated to a frantic speed in an effort to escape the danger. When fragments from falling bombs cut the electric power lines, the driver was forced to stop the bus. The passengers were filled with panic. Francesco was certain that he was going to die. In the midst of great fear and confusion, everyone then exited the bus and ran toward an air-raid shelter that was nearby. Due to an obstacle in his path, Francesco had great difficulty getting off of the bus. He was the last person to enter the air-raid shelter. Inside the shelter, the Capuchin monk who had been on the bus, had already begun to recite the Rosary. It had a calming effect on all who were gathered there. Soon everyone was praying with the Capuchin. Meanwhile, bombs continued to explode all around. The air-raid shelter shook on its foundation and Francesco knew that it could collapse at any moment. However, amid all the noise and destruction, there was no panic or screaming inside the shelter. The Capuchin monk seemed to inspire confidence in everyone. Thirty minutes passed. The small group had just finished reciting the Rosary when the sirens in the city gave the “all clear” signal. The Capuchin was the first to leave the shelter. Everyone then followed out behind him. “Were you the monk who was on the bus with me?” Francesco asked Padre Pio. “Well, who did you think it was?” Padre Pio answered. “I have already explained to you that Jesus and the Blessed Mother can intervene in our lives, even if we are not aware of it.” Francesco had always known how lucky he had been to escape death that frightful November day. He was convinced that Divine Providence had assisted everyone who was in the air-raid shelter with him. At the time, he had not even heard of Padre Pio. When Padre Pio saw Francesco in the confessional line, he told him that he had been waiting for him for a long time. The wartime incident that Padre Pio brought to Francesco’s attention had happened twenty-four years before. Had he actually been waiting for Francesco to return after all those years? Francesco was convinced that he had. On one occasion, Padre Pio told Joe that five people who had visited the monastery needed a ride back to their home in Foggia. He asked Joe to drive them back. Joe told Padre Pio that it was against United States Army regulations to use military vehicles to provide transportation for civilians. Padre Pio was very firm and insisted that Joe do him the favor. Joe carefully considered the matter but finally decided against it. The risk of getting caught was too great. “Army regulations forbid me to transport those who are non-military. I am sorry but I cannot break the rule,” Joe said. Speaking with authority, Padre Pio then said to Joe, “Remember this. Anytime I ask you to do something for me, it will work out. You need have no fear.” Joe was finally convinced. He then allowed the two men, two women and a little boy to get into his military jeep. Shortly after they were on the road, Joe saw two Military Police Officers coming in their direction. The Military Police Officers looked in the jeep but passed right on by without stopping Joe. At that moment, the air became filled with a delightful perfume. As they continued on the road to Foggia, they encountered one Military Police Officer after another, but they were never pulled over. The fragrant perfume stayed in the air until the five Italian citizens were dropped off safely in Foggia. 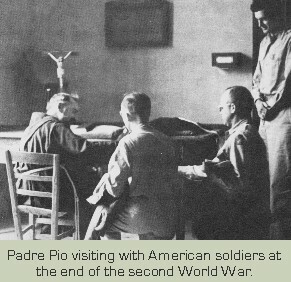 I met Padre Pio when I served in the U.S. Army Air Corps during World War II. I had enlisted in January 1942 and was eventually sent to the U.S. military base in Cerignola, Italy. As a Staff Sargent, I was assigned to the ground crew and worked in the technical supply department for the U.S. fighter planes. I was also the assistant to our chaplain, Father Stanley Kusman, S.M., a Marianist priest. One day, Father Kusman asked me an unusual question. “Jerry, how would you like to visit a saint today?” He went on to tell me a little bit about Padre Pio and invited me to go with him to Padre Pio’s monastery. I had never heard of Padre Pio but I was happy to accept his invitation. Two other GIs from my squadron went along with us. Father Kusman drove us to the monastery of Our Lady of Grace in a military jeep. The church of Our Lady of Grace was a poor little country church. It was very plain and very simple. As soon as we walked through the door, I realized that I had forgotten something and I went back out to the jeep to get it. When I walked back into the church, I was overwhelmed by an intense fragrance of fresh flowers. The wonderful scent of carnations, lilies, and roses filled the air. I looked around but there were no flowers anywhere inside. Father Kusman was in the sacristy, conversing in Italian with a Capuchin who wore a brown habit with a cord at his waist. As I drew closer, I realized that he was talking to Padre Pio. As I looked at Padre Pio, I felt wonderstruck. I knew immediately that he was an extraordinary human being. Father Kusman then introduced me to him. I did not speak Italian but even if I did, I would not have been able to say even one word. I felt overwhelmed by his presence. Father Kusman asked Padre Pio if we could attend his Mass on our next visit and if I could be his altar server. “Si, si,” he replied. There were a few children in the church making noise and Padre Pio let them know in no uncertain terms that they were to be quiet. That was my first brief meeting with Padre Pio. that Padre Pio had visited her through bilocation. The next time Father Kusman took us to the monastery, I was apprehensive. Thinking about being Padre Pio’s altar server was more than a little unsettling. I hoped that I would be able to perform all the duties of the altar server well and that I would not forget any of the Latin responses. It turned out to be a very long Mass. As I knelt on the stone floor of the dimly lit church, my knees began to ache. It was very cold inside the church. Since it was wartime, the congregation consisted mainly of women and children. Most of the men in the village had no doubt been called up to serve in the Italian army. During the Mass, everyone stared at Padre Pio’s hands. I saw that the wounds in the center of his hands were bleeding at the time of the Consecration. All of the American soldiers who were there that day were deeply impressed. Meeting Padre Pio and assisting at his Mass served to strengthen my faith. It also gave me a sense of confidence that I would be protected. As soldiers in the second World War, our lives were in constant danger. I felt a peace within and I knew that I had met a living saint. After the war, I attended Holy Cross College in Massachusetts. I eventually got a PhD in English and I enjoyed being a college professor for more than 25 years. I turned 90 years old, this year, 2010. The experience of meeting Padre Pio has stayed with me for my whole life. There was a woman once (name withheld) who lived in Italy whose husband had died in the second World War. After the death of her husband, her in-laws treated her and her two children very badly. The woman was in great financial need but her in-laws were not willing to help in any way. To make matters worse, they took possession of the home that had belonged to her and her husband. The woman and her children moved from the city into the country, thinking that it would be less expensive. When her eldest son was about to make his first Holy Communion, the woman had a dilemma. She could not afford to buy the proper clothing for him for that very special day. She decided to alter one of her husband’s suits to fit him. In that way, her son would be able to be dressed appropriately, just like all the other children. Her relatives refused to return her husband’s suit to her. They also confiscated most of the household possessions. Finally, they sold her husband’s home and kept all of the profits for themselves. The woman tried to confront them about the injustice of their actions, but they refused to speak to her. The woman needed advice about her many problems, especially her desperate financial situation. She wanted to talk to Padre Pio but she could not afford to make the trip to San Giovanni Rotondo. Her faith in Padre Pio was indeed great. She knew in her heart that nothing was impossible and she never lost hope that one day she would be able to visit him at the monastery of Our Lady of Grace. As it turned out, the woman won 25,000 lire in the Italian lottery. The unexpected money enabled her to make the trip. Everything seemed to work out in her favor. Once she arrived in San Giovanni Rotondo, she began to look for lodging. Finding a room was harder than she had ever imagined. Although she had to settle for sleeping in the corridor of a local establishment, she was grateful that at least she had a roof over her head. The woman attended Padre Pio’s Mass and was very inspired. She had the unmistakable impression that Padre Pio was in “direct contact with God.” She felt carried away into a place of great peace. The Mass had such an impact on her that she felt totally transformed. She began to have the desire to change her life. She had been living with a man whom she loved very much. She decided that when she returned home, she would end the illicit relationship. She wanted to talk to Padre Pio about her decision. The woman was very nervous when she stepped into Padre Pio’s confessional. “I want to make a full confession,” she said to Padre Pio. “I want my life to change. When I go back to my home, I want to feel like I have felt during these days that I have spent here in San Giovanni Rotondo.” “Are you truly sorry for your past sins?” Padre Pio asked her. “Yes, I am truly sorry for all of them,” the woman replied. “Go in peace,” Padre Pio said. He gave her absolution and placed his wounded hand on her head. He let his hand rest on her head for quite a long time. “When I return to my home, what can I do so that I will be able to live as I have lived these days near the monastery?” the woman asked. “When you go back to your town, you will meet someone who will help you,” Padre Pio answered. About a week after returning to her home, the woman happened to make the acquaintance of a kind lady who helped her in incalculable ways. She remembered that Padre Pio had told her that she would meet such a person. Back at the factory where she worked, she made a public statement. She apologized to all of her co-workers and told them that she was sorry that she had used bad language in the past. “I apologize for the off-color jokes I once told you all. I promise you that you will never hear me tell them again.” She let go of the resentment and anger that she had held in her heart for her relatives. She knew that her desire for revenge was wrong and through prayer she was able to overcome her feelings of bitterness. The woman decided not to marry again. Eventually, she was able to receive her deceased husband’s war pension which was a great financial help to her. She continued to pray to Padre Pio faithfully. Through Padre Pio’s intercession, one of her sons received a physical healing. As the years passed, the woman’s situation continued to improve and she received many graces for which she felt a profound gratitude.